About this Fragrance ~ Reminiscent of freshly strewn leaves on cobblestone sidewalks. 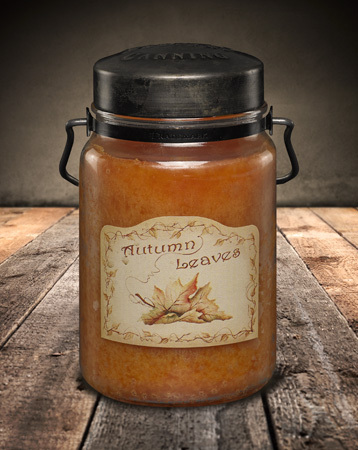 A crisp assortment of Hazelnut, Cinnamon Bark, Cinnamon Leaves, Spun Sugar Strands, Vermont Maple and White Ginger. About this Product ~ Our Classic Jar Candle™ features labels that are reproductions of hand-painted designs by artist Dee McCall. All of our Classic Jar Candles feature the signature rustic metal lid stamped with the McCall's Country Canning logo and decorative handles. © A.L.M. Fine Cabinetry. 2019. All Rights Reserved.